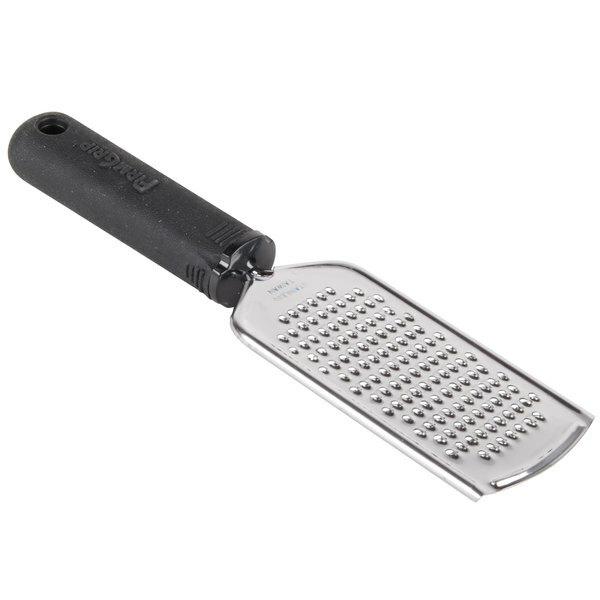 Whether you need to quickly shred a large block of cheese for your brick oven pizzas or grate chocolate or coconut, this Tablecraft E5615 firm grip handheld grater is sure to quickly do the job. 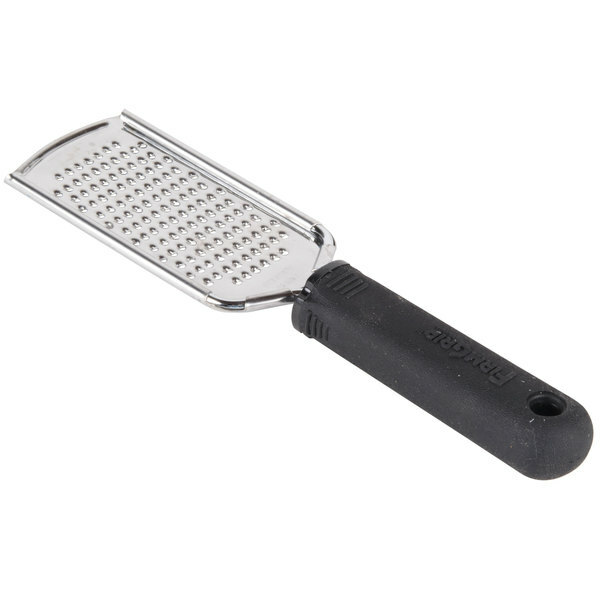 Also called a rasp grater, this handheld tool features a black, ergonomic, non-slip grip and has small holes for fine grating and shredding. The small sized holes are excellent for adding the finishing touch on dishes. Use it for everything from grating cheese over a salad to grating cinnamon over a hot beverage! 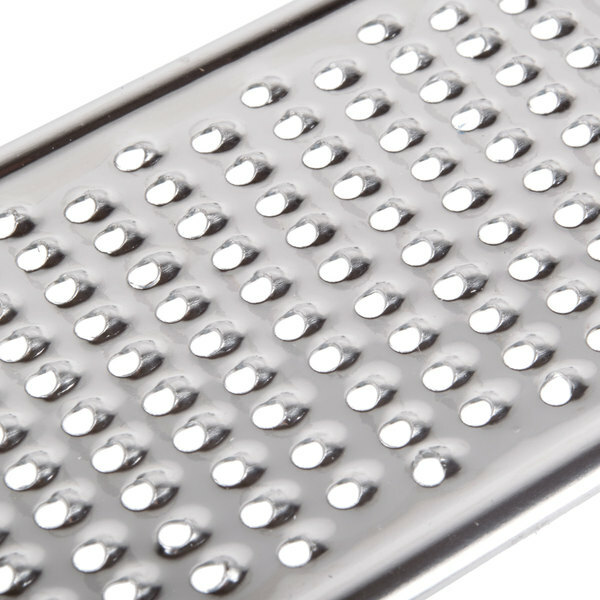 Plus, the flat design means this grater has a small footprint and is easy to store. 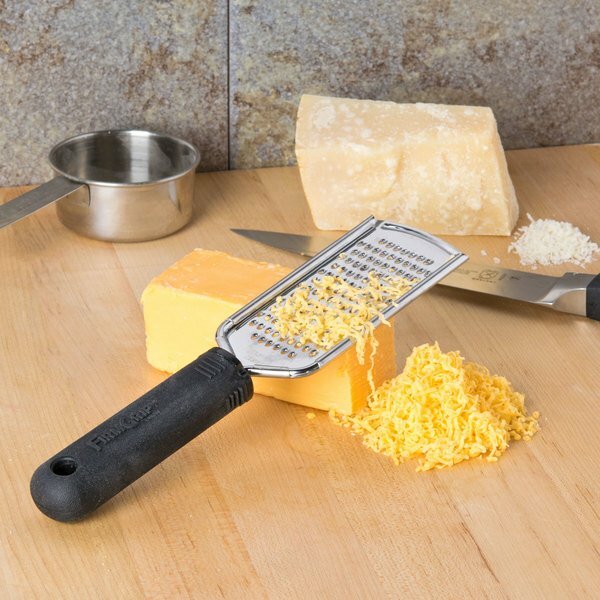 Featuring a non-slip hand grip at the top for safe and easy operation, this grater is also designed for ease-of-use. It can do more than shred cheese, too; it makes quick work of ginger, garlic, and even vegetables to add flavor and color to your most popular dishes! Its versatility makes it a must-have tool for any commercial kitchen. I like to buy my own block of cheese and grate it my self. I had to buy this on because my other one snapped in half!!!! The Tablecraft Firm Grip Handheld Grater with Small Holes is designed perfected for shredding small shreds of cheese for salads or tacos. It is quality made and easy to clean. 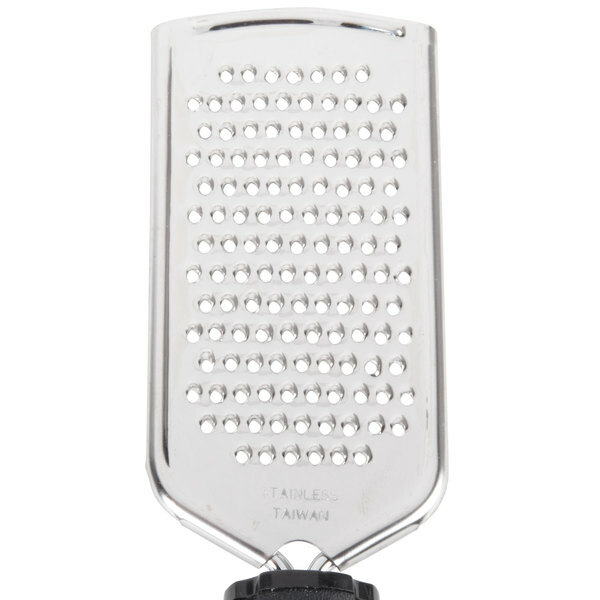 The tablecraft firm grip handheld grater with small holes is a great product. It is sturdy and well constructed. The small holes are great for grating off fine shreds of cheese for salads. The grater is easy to wash. 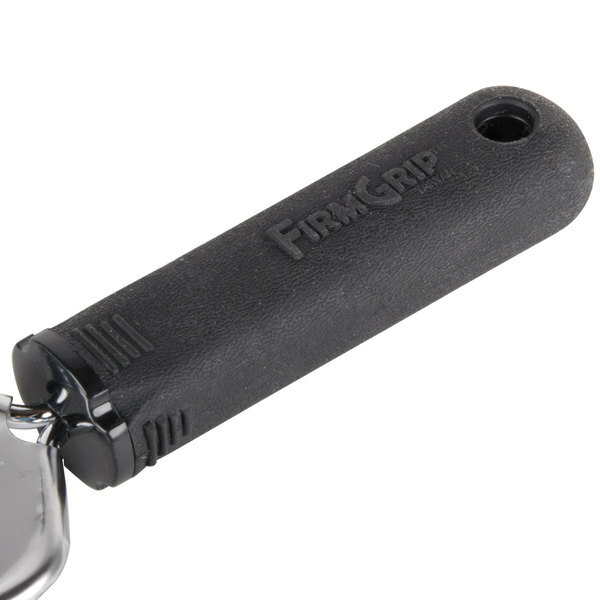 The handle does offer a frim grip just as advertised. These work okay. They work best with softer items. It is easy to use and no worries about the handle slipping. This grater gets the job done for the price. Sturdy with a solid handle and even sharp grating holes. Only downside is the size. This is a small grater so for larger items it wouldn't be too useful. We use it for ginger and it gets the job done. I really like the size and shape of these! Perfect for home kitchen use! Definitely a small grater, I recommend the med or large for softer cheeses. I really never use this to be honest since i purchased this to be used at home. I do use it occasionally when i want to have a finer grate of cheese such as parmasan reggiono for my homemade pizza. I still will recommend it as it is very high quality. Money well spent,love the handle,really sharp blades,Handles all my needs well,and fits well in my chef bag,glad i purchased it,will recommend to all my friends. Our bartenders use these for zesting citrus and spices for garnishes on cocktails. Does well with nutmeg and cinnamon, grip is very nice, cleans easy. 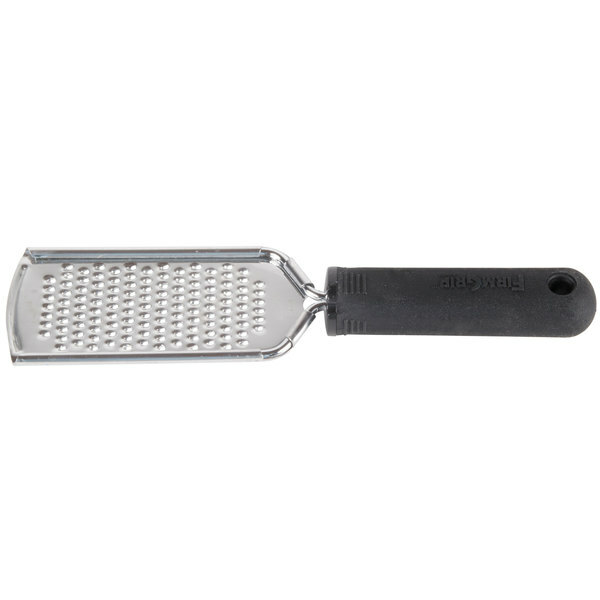 This grater does it all, soft food like cheese and citrus zest and hard food like cinnamon and allspice. The grip prevents the grinder from slipping. Very well built, very sharp and works really well. You can't find a grater of this quality and performance for a better price. Highly recommend. This small grater is perfect for hard cheeses and also works great for grinding whole nutmeg nuts and getting a fine zest from citrus. I am very pleased. Solidly built, works through cheese fast and makes a nice end product. Good for sprinkling on salads, gratins, anything where a fine grate is needed. I love having this small grater on hand to grate fresh cinnamon and nutmeg in pantry! Very cheap and great to have in your knife kit. We use this grater everyday to zest fresh fruit. It finely grates citrus peels to allow for flavor to come through but does not leave large chunks of zest in our frosting and batter. The Tablecraft E5615 Firm Grip Handheld Grater w/Small Holes says it all. Very firm grip with the necessary small holes needed to give you the exact size for just the right amount. By far this is my absolute favorite small grater. I dont recommend for doing cheeses, as the holes clog very easily, but it works great for your fine sliced items. I use it for my carrots for salads. I love it.